Summer is here and nature is calling, loudly. (Brilliant sunshine and gentle breezes have that way about them, don’t they?) What better way to answer than to walk right into the season—and into the woods, along the water, onto the best Michigan trails. Consider this your hiking bucket list. 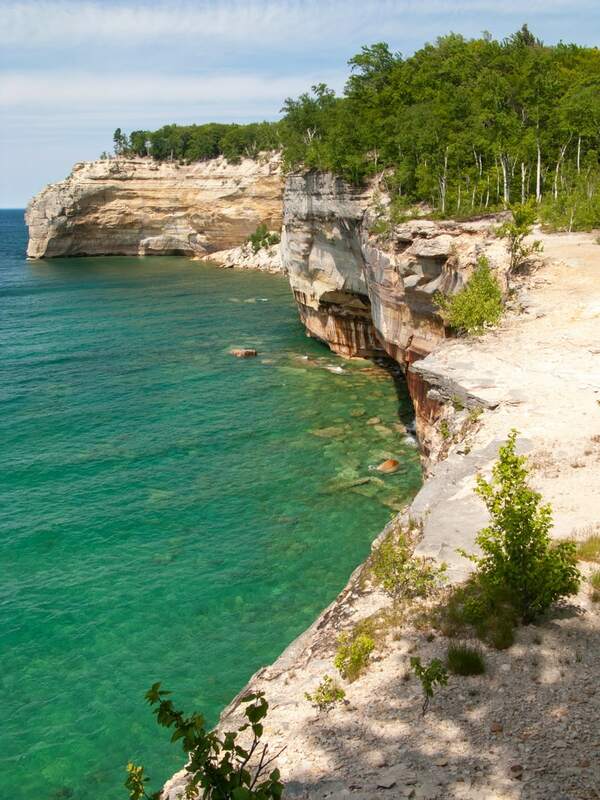 Explore a hiker’s heaven on the Lake Michigan shore, with 13 mainland trails and 105 miles of pathway winding through woods and over dunes and delivering sweeping views of the Big Lake. 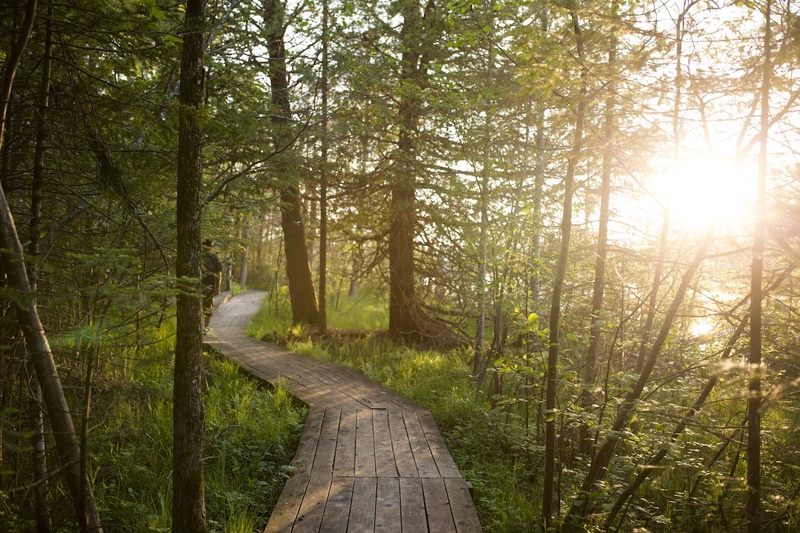 Sleeping Bear treks provide countless ways to explore and immerse in Northern Michigan beauty. If you’ve got a solid day, starting at the Dune Climb on M109 and hiking up and over the dune all the way to Lake Michigan and back is a satisfying challenge. 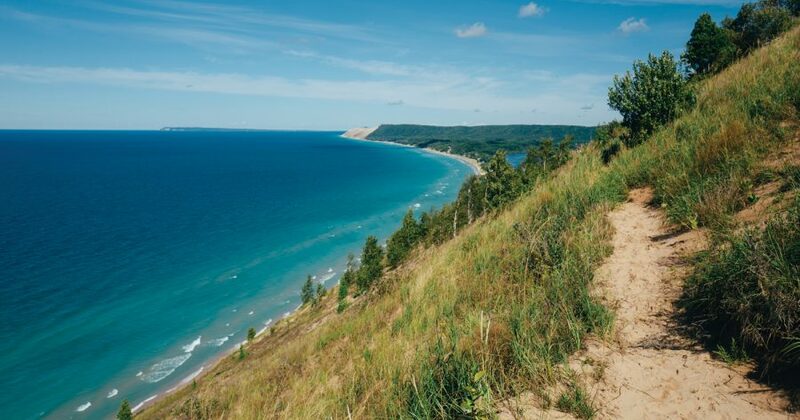 At the top of the dune climb, take the Dunes Trail, a 3.5-mile round trip that ushers you across a sandy dunescape to the cool waters of Lake Michigan. Keep in mind that the hilly, sandy terrain can be exhausting, especially for little ones and elderly, and a round trip may mean several hours in unfriendly temperatures. Pack water and snacks, and wear appropriate footwear—hot sand will burn your feet badly—and your swimsuit (towel optional; you’ll dry off on the return trip). Have just an afternoon? The Empire Bluff Trail is a must-see and the perfect place to wow never-before-been-to-Northern-Michigan guests. This .75-mile trail (1.5 miles round trip) opens onto a bluff 400 feet above Lake Michigan for a spectacular view of the water. There and back takes under an hour, but know there are a couple of short-but-steep stair-step climbs along the way, and know you’ll want to hang out there for a good long while. Time it right and catch a stunning sunset from the boardwalk on the bluff face. Après-hike, Joe’s Friendly Tavern in Empire is your best bet for mouthwatering burgers and brews. For an especially family-friendly experience, stop by Cherry Republic in Glen Arbor (did someone say ice cream?) or, if you’re looking for picnic food for the hike, stock up at Anderson’s Market in Glen Arbor, home to gourmet deli items. Pitch a tent at D.H. Day campground, located on M22 between Glen Arbor and historic Glen Haven. (Reminder: no reservations accepted.) Another camping option: Empire Township Campground three miles southeast of Empire village—reservations are accepted. Trails abound here—90 miles’ worth—and your hike will feature nature at its finest: majestic waterfalls, cliff-side trails, woods, colorful sandstone and plenty of Lake Superior shoreline. Quick tip: consider taking your hike in early June before the black flies get bad, or wait until July when these pesky insects diminish. Bring bug spray either way. Pick your distance, from 2 to 10 miles round trip, with the Chapel Basin/Mosquito Falls hike. Several trails lead through pristine forests to views of cliffs, beaches, waterfalls, and the famous Chapel Rock. For adventurous hikers, tackling the North Country National Scenic Trail provides the ultimate nature excursion. 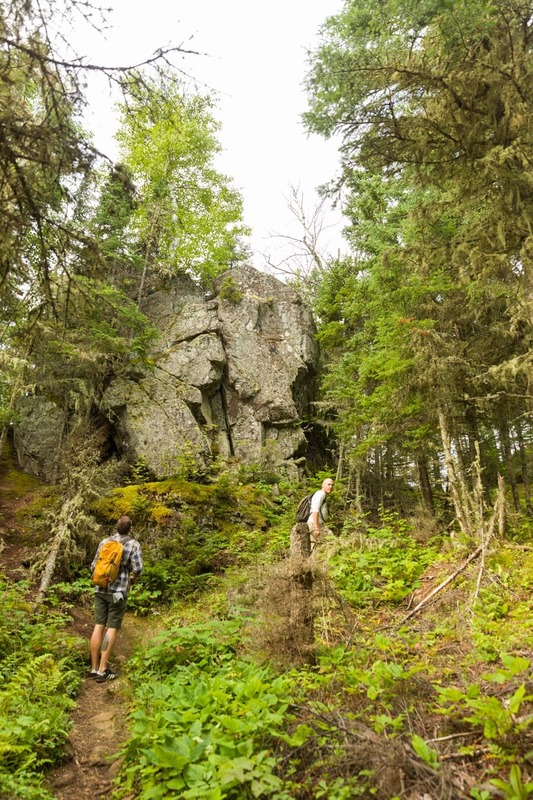 The trail passes through the 42-mile-long park and traces the Lake Superior shore. Backcountry camping is available at 14 campgrounds (each with multiple sites; permits required). In Munising, at the park’s west end, be sure to stop by Falling Rock Cafe and Bookstore, home to thousands of good reads along with free wireless, homemade food with vegan and gluten-free options, coffee and tea, and ice cream. Check out Munising Tourist Park Campground for views of Grand Island and the lakeshore. (127 sites; two sets of modern bathrooms and showers, 78 sites with electric and water hookup and 23 walk-in rustic tent sites.) Seeking something more modern for day-tripping ease and comfort? Try the Pictured Rocks Cottage (2 bedrooms, 1.5 baths). This paints the picture: 22 miles of Lake Superior shore, nearly 60,000 acres of wilderness, including 35,000 acres of some of the most remarkable old-growth hemlock and hardwood forest in all of North America, Michigan’s second-largest waterfall, and ancient mountains that rise about 1,300 feet above Lake Superior. Your jaw will drop at the sight of Lake of the Clouds, a stunning, narrow body of water far below the park’s overlook (accessible by car). Take the 4-mile-long Escarpment Trail from the parking lot trailhead to witness some of the most scenic views in the Porkies. The rugged path follows the escarpment edge, skirts over Cloud Peak and Cuyahoga Peak, and descends to the north end of Government Peak Trail. 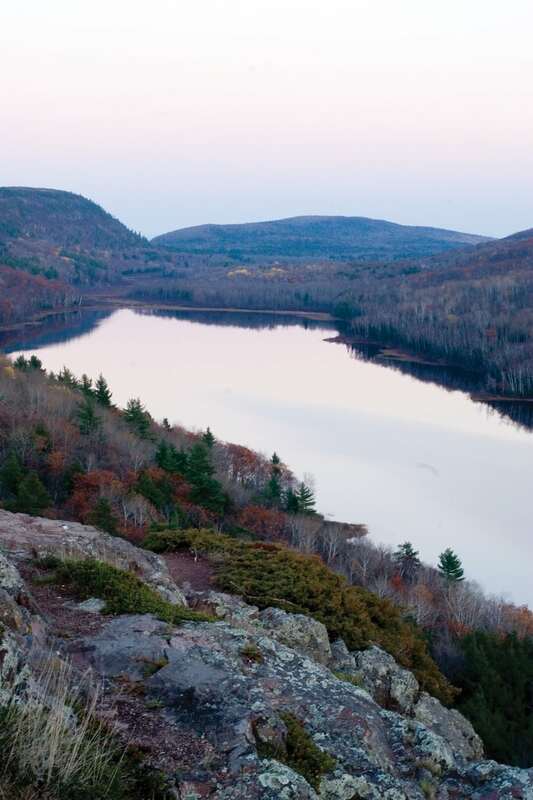 Sheer cliffs and the vistas of the Lake of the Clouds will stick with you. It’s ah-mazing. Head to the southwest side of the park for trails and waterfalls. The East and West River Trails follow the Presque Isle River, the largest and most beautiful river in the Porcupines. Boardwalk and viewing platforms serve up captivating views of the stream. Spectacular waterfalls, cascades and rapids are but a short walk from the parking area. Camp at the Porcupine Mountain Wilderness State Park, home to rustic and modern sites (book early for waterfront sites!). Yurts and lodges also are available. Take the Isle Royale Queen IV, a passenger ferry that operates between Copper Harbor, in the U.P., and Rock Harbor on the northeast end of Isle Royale National Park. After arriving, you’re able to spend three hours exploring the island (the ship then departs Rock Harbor at 2:45 p.m. for Copper Harbor). Isle Royale Seaplanes also offer day trip service to Rock Harbor. Try the Scoville Point hike, a 4.2-mile loop. The trail winds between the forest and shoreline out to spectacular Scoville Point. For a longer trek: Mount Franklin, a 10-mile round-trip excursion. To reach this scenic overlook honoring Benjamin Franklin, take either the Rock Harbor Trail or Tobin Harbor Trail until they meet the wooden post that directs you to the Mount Franklin Trail. Then begin your ascent of Mount Franklin, a high point on the Greenstone Ridge. From the overlook, view the island’s interior and north shore, as well as the distant Canadian mainland. Bring along a daypack with lunch, a day’s supply of water, and rain gear on this all-day hike through the island wilderness. After your day of hiking and exploring, rest and relax on the deck of Rock Harbor Lodge & Marina. The Greenstone Grill serves pizza, burgers, sandwiches, late-night snacks, cappuccino and a wide selection of regional beer and wine. The Lighthouse Restaurant, also on site, offers breakfast, lunch and dinner. At Rock Harbor Lodge, cottages equipped with kitchenettes and sleeping up to six are located in the wooded area between Rock Harbor Marina and Tobin Harbor. Lakeside lodging is also available. Nearly eight miles of hiking trails wind through the 1,325-acre wetland preserve known as Grass River Natural Area. For more adventurous options, consider the nearby Jordan Valley Pathway. At Grass River Natural Area, meander along the 6 miles of serene shoreline. Take a guided walk with a naturalist or strike out on your own—either way, you’re sure to fall in love with the wildlife and picturesque landscape. Day hikes or longer excursions—there’s an 18-mile round-trip overnight hike—are possible on the Jordan Valley Pathway, which traverses the 18,000-acre protected valley. Expect wide-open vistas, wetlands and forests along the Jordan River—the state’s first designated Wild and Scenic River. Two trailheads: Eight miles north of Mancelona on M-66 to Pinney Bridge Road and 11 miles north of Mancelona on U.S. 131 to Deadman’s Hill Road. Trails are marked, but they can be confusing. Before you set out, best call the state for a good map: 989.732.3541. For “good home cooking,” stop by the Lunch Box in Bellaire. Find small plates, vegetarian offerings and more. Camping is allowed at the two state forest campgrounds, the Pinney Bridge and the Graves Crossing campgrounds. Mission Point Lighthouse, at the tip of Old Mission Peninsula, is surrounded by hundreds of acres of public land, with miles of trails. Find trail maps in the park. Friendly pets off-leash are welcome, too. Expect spectacular views of the beach and deep-forest trails; open year round and until 10 p.m. daily. From the parking lot near the lighthouse, head west for a short jaunt along West Grand Traverse Bay before crossing Center Road and continuing on the trail into the woods. You can opt for an out-and-back, retracing your steps to the lighthouse start, or take a few smaller interior loops for a nice afternoon hike. For a longer trek, head east from behind the lighthouse. You’ll have a couple of options for a solid few hours of exploring—the longest loop takes you along the east side of the peninsula and to a southern trailhead, with additional loops eventually leading to the west side of the lighthouse. For a multi-day hiking adventure, spend an afternoon wandering the trails at the lighthouse and a second day heading to the 200-acre, Grand Traverse County–maintained Power Island, a dedicated quiet nature preserve home to 3 miles of waterfront and more than 5 miles of hiking trails. From Bowers Harbor, Power Island is 3.5 miles. Paddling by kayak or canoe is a pleasant trip on a calm day, but not when it’s rough: know the weather before attempting. On your way to the lighthouse, pick up lunch to-go at Peninsula Market on Center Road for a beach or trail picnic. Grab an après-lighthouse-and-trail-trek bite at Jolly Pumpkin, a restaurant, brewery and distillery (about 8 miles south, at Bowers Harbor). Try the white pizza or perch. Stay the night on an island: five rustic campsites are available on Power Island, five more on Bassett Island, which is connected to Power Island via the isthmus. Reservation information. 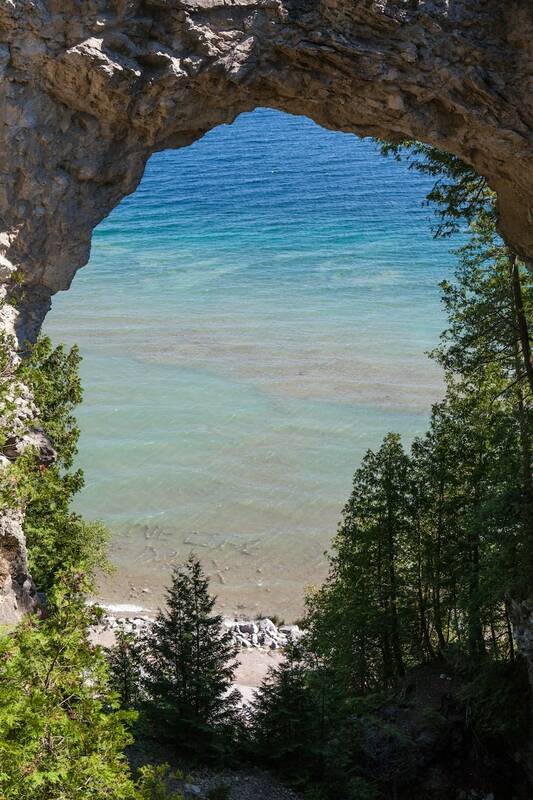 From guided walks through historic landmarks to on-your-own trail explorations, Mackinac Island offers a variety of hiking options (the hike around the island is just over 8 miles). What else would you expect from an island where the automobile never replaced the horse and carriage? Wanting to see the island’s interior? Several hikes take you through the forest with some steep climbs up to Fort Holmes, which has spectacular views and is a quiet spot for a picnic. For a detailed map of Mackinac Island trails, stop at the Visitor’s Center, right between the marina and the Chippewa Hotel on Main Street. There are public restrooms at the Visitor’s Center, too. Try Cawthorne’s Village Inn on Hoban Street, a lunch, dinner and late-night menu spot that has been a favorite of locals and tourists for 45 years. Their house special Planked Whitefish has received world-acclaim. Book a stay at Harbour View Inn, offering a historic feel and exceptional view (starting at $135/night).